Hi Wolf, when reading your posts, I thought of Meer cats. They stand around on their back legs. If meerkat man sightings start turning up i will be getting a hunting license myself. I cant stand those talking annoying meerkats on tv. You make a good point there Searcher. I had a look but couldnt find any Aboriginal lore on anything like a dogman . I was wondering if Dogman sightings are just Yowies running on all fours. this may be their response. Something on all fours must be like a dog. I like to think that my mind is open enough to accept any way-out ideas about cryptids. of Dogman being in Australia as well. of her husband having another experience with Dogman in the water at Natural Arch. Apparently there were other campers nearby, so why haven’t they come forward with their story. have at least another sighting at some time. If I had not had that dream I would scoff at all the dogmen reports... likely I place too much on the dream, it' s just that it did not seem like a dream at the time and I am very used to lucid dreaming. I have been lucid dreaming ever since I was a teenager at least and have very few dreams that have held in my memory like that one did. My wife has told me to not try to convince her in any way they are real. She wants to believe in Bigfoot and Yowie and is very very good at reading people so is 95% convinced from witnesses the hairy blokes are real. But when it comes to dogmen, forget it. Just last night she said to me she would have to die before she thought dogmen existed. She has not heard or read a single report like I have (every one of Vic Cundiff's, SasChron, Dark Waters, and others). 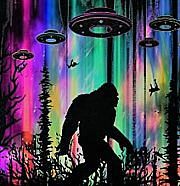 Like Sasquatch, the sheer numbers and 'believability' of the dogmen reports (plus my dream) has me starting to think they are as real as Bigfoot. Wolf wrote: If I had not had that dream I would scoff at all the dogmen reports... likely I place too much on the dream, it' s just that it did not seem like a dream at the time and I am very used to lucid dreaming. I have been lucid dreaming ever since I was a teenager at least and have very few dreams that have held in my memory like that one did. Hi Wolf, some good points you make. You must have a very understanding partner. Have you got any comments on this idea that people who witness cryptids do so on a number of occasions in their lives. Like walking around with a radio tuned to a specific frequency. Your lucky having those dreams which provide meaning and guidance to your consciousness. you stop flying and return to earth. I too think dogman is stupid and dont want to believe it but if evidence is there then its there and im not saying there is any(evidence). Ive had the flying dreams too and wake up or descend to the ground once i start thinking of what i am doing (flying). I know nothing about them other than I've had them. Im glad Tuckeroo and Wolf mentioned it as not something i would look into. Ive been voluntarily on the couch a lot the last few weeks due to running and yelling in my sleep and last night ive been told i was in deep conversation with somebody (or something !) which i cant remember. Lol. Maybe some people are supernatural magnets and tuned in. Ive seen some weird things myself with some odd stuff happening to me and others while ive been around. I think it's more if you have seen something "supernatural" happen that you cant explain away then you may have an open mind to such things even if you dont realise it yourself so you may notice something someone (normal!) might miss or have a second look instead of ignoring it. I've become very good at debunking any weird experiences ive had but a few things i cant do anything about simply because theyre obviously real or i cant explain them away...yet! Yowie bait wrote: I too think dogman is stupid and dont want to believe it but if evidence is there then its there and im not saying there is any(evidence). sleeps, but on the odd occasion every few years, I will wake myself up talking to someone in a dream. Hey Tuckeroo. Thats no good if you're prone to the sleepwalking. Ive woken up talking and sleep problems in the past but usually sleep well at this place. I know a few sleepwalkers. One guy is huge and knocks over everything when hes sleepwalking. Another jumped out the window at night and was found playing or thinking he was playing the tabletop arcade machines in the games room at the local fish and chip shop by the owners when they were closing up. It funny but scary really! Im sure theres people switched into the supernatural zone as you suggest. Wouldnt be a great way to be i reckon. Especially if theres the dogman! Yowie bait wrote: Ive had the flying dreams too and wake up or descend to the ground once i start thinking of what i am doing (flying). I know nothing about them other than I've had them. That's too bad. You will get past that and be more able to control your flight and your journey through the dream world. It is when you fly in a lucid dream that the thrill and sheer joy at doing so is indescribable. Yowie bait wrote: Ive been voluntarily on the couch a lot the last few weeks due to running and yelling in my sleep and last night ive been told i was in deep conversation with somebody (or something !) which i cant remember. Lol. When I was a kid my older brother woke me up sitting in the bathtub, with my jammies on. I remember waking up sitting on the dunny. One morning he said, "What the hell where you doing last night?" Apparently I had gotten up (we shared a room) gone and found up a box, walked to his bed and threw it on top of him. That night he didn't fall for it when I pretended to sleepwalk over and punch him on the nose. Yowie bait wrote: Maybe some people are supernatural magnets and tuned in. ...or just eat way too much ice cream before bed. hope you don't get teh wrong impression for the little crapping icon... it was chosen to represent what iceream does to one' s constitution, not to imply that what you said was c**p.
YB, do you have lucid dreams? Ones in which no matter how scary the dream, you aren't scared because you are in control of the dream? Like you're the screenwriter in your own movie. By focusing on this sound you can then get closer and closesr, with your awareness, to the exact moment of falling asleep. With practice it becomes easier and easier and you will then be able to enter the dreaming world in full control of your experiences in it, yet still able to watch and observe what the 'dreaming' is telling your subconscious. If you need answers to something in your life, before you go to sleep, drink half a glass of pure water, thinking of your question as you drink. Even if you forget the dream (or that you even asked a question) drinking the other half when you wake up will trigger your memory and help you to remember the dream with the message, or at least seal the message into your subconscious where it can work away on your feelings and emotions and get through to your conscious world anyway. Hey Wolf. Thanks for the tips. I will give it a try. I did have a good dream fly over the cow paddocks and industrial area down the road once and didnt crash land that time. Didnt think you were suggesting my post was c**p and couldnt blame you if you did. Wasnt insinuating i was a "supernatural magnet" but reads like that. Sounds pretty cool though! After reading all the comments above, with some fascinating comparisons and stories - its still a hard pill to swallow. The comment that seeing an actual dog/human walking on hind legs is an interesting notion. I guess if a T-Rex could do it then its not so strange. The lines between myth and reality are always converging but the line of truth always keeps them separate. Even the Yowie concept borderlines and crosses over but the general human think tank still considers these species/people as a myth. Thus why folks like us are outcast in mainstream conversations. Remember those who though the world was round and how they were laughed at! The Dogman reality has a few hurdles if it wants to reach the almost acceptance of the Yowie. For eg - thousands of reports exist in favour of the Yowie. Official authorities have hinted at its existence but never confirming for various reasons. Dedicated researchers have produced evidence to really challenge the skeptics and each day that passes means one tiny step closer. I'll be closing my blinds when I go to bed tonight!!!! after denouncing the dogman!!! ChrisV wrote: After reading all the comments above, with some fascinating comparisons and stories - its still a hard pill to swallow. Hey Chris. You are a brave man denoucing dogman like that. Gives me the shudders too but im not game to straight out and denounce him like that ...just in case! They should be able to put in a good word for you. Better keep em happy with the snacks. Im suprised no ones mentioned youtube sensation the infamous"australian dog man".Hes disturbing enough and hes human...i think? Going by the reports from the US, a dogman is more likely to see your dogs as food rather than compatriots. Looks like chris is screwed then! Ive read a few comments on some youtube dogman videos where theyre saying the dogmen and bigfoot are amassing ready to take over the u. s starting in the regional areas. Could be the same guy on different video comments sections but bloody entertaining stuff. Would make for a good movie. Ive noticed a few dogmen and bigfoot type creatures on movies I've seen lately. English werewolf movie "howl" was one and the other from "out of the dark" i think it was called. Check out the guy below from the latest "hunstsman" sequel. The others (goblins i think they were called)were hornless and did look more bigfootish but were c**p cgj. Best scene in the movie too. Oh dear, it seems with have a Republican / Trump supporting anti-Obama conspiracy theory sprouting right-wing whack job in our midst . . . let's just keep the subject to sasquatch / yowies / dogmen please. Actually, I think Trump is an egotistical drongo of the highest order. The two party system (both here and in the US) is designed to give people the illusion of choice (and saying so on ABC talkback got me cut off). Hopefully now that US people see they have a choice between Hitlery Clinton and Trump they will look to a third party like the LIbertarians. Have to disagree with your interpretation of supernatural. Take a look at this video at 37min. 47secs. https://www.youtube.com/watch?v=FEvjrerewKU. This is inexplicable it defies everything relating to a scientific explanation of gravity. Does anybody not listen to Vic Cundiff's Dogman Encounters? .......Truly terrifying. Listen to Dogman Encounters Episode 77 (Scariest Dogman Encounters of 2015!). I've moved on somewhat from Yowies and Bigfoot and more into the Dogman enigma. I think people can get their heads around Yowies/Bigfoot but Dogman goes way beyond the realms of reactive phenomena. Dogman encounters in Australia are nowhere as commom in Australia as in the US although they do occur. Listening to video https://www.youtube.com/watch?v=uc2k0AqodkA the guy reports as a child he witnessed a Dogman that had been killed by his father and uncle brandishing double barrel shotguns. These dogmen had been harrassing his dad's and uncle's homesteads when they confronted one. What I found interesting is that the shotgun shells had been loaded up with dimes for more impact. Before 1965 dimes consisted of 90% silver and 10% copper, got me thinking, is there any truth in the myth that only silver can kill a werewolf? or maybe I've watched one too many werewolf movies. Tuckeroo wrote: I was wondering if Dogman sightings are just Yowies running on all fours. ....I like to think that my mind is open enough to accept any way-out ideas about cryptids. I tend to agree. The fact that there are indigenous stories of Hairy Men lends them a great deal of credence (in my opinion). The historical accounts that have appeared since Europeans arrived also give the Yowie some extra credibility (in my view). The modern accounts are detailed and numerous, also adding to my belief that they exist. The dogman thing is different again. I'm not sure why, I just have trouble believing in it, and I have no trouble believing in the Yowie, that there are different varieties of Yowie, or that there are possibly Thylacines on the mainland, or even big cats. All of this seems plausible - given the span of time over which these things have been seen and described, the sheer number of people from all walks of life and from various historical eras who've described seeing very similar things, despite having no link to each other and no reason to make up such stories. The dogman stuff seems far too recent for my liking. I can even accept Bunyips as some sort of relict population of megafauna, or Thylacoleo still roaming around in Queensland...but I just can't buy that dogman is out there. Maybe it says more about me than anything else....I just can't bring myself to believe it. At first i thought the dogman thing was hilarious. Such a stupid name conjured up by some little kids on Halloween . Even funnier when i read reports on them chasing cars. and with another witness who saw the same thing. Ive since seen other weird things as well so i cant discount the dogman. Thing is, i dont really want to see one to prove it to myself and if they do exist, i hope theyre not here in Oz. For me, it's an intellectual exercise but also involves some sort of 'gut instinct' factor. I just think "Yowies...yeah...Dogmen...nah". I've never seen a Yowie, but I think they exist. I somehow doubt the dogman story, however. Lets hope your gut instinct about the dogman is right Simon! In the us they had the Dire Wolf many years ago. Practically the only record of them comes from the tar pits where they recovered whole skeletons. Is this how 'Dogman' evolved? Regular Dire wolves standing upright to see over the tall grasses of the plains for longer and longer periods? Reports of today's Dogmen tell of them moving on all fours more than bipedally, but also able to walk and run bipedallt if they choose. Are Dogmen simply relic Dire wolves that, because of greater intelligence (maybe due to bipedalism), excellent night vision and nocturnal hunting behaviour, and the ability to walk 'upright' have managed to survive the human onslaught? I took an image of a dire wolf skeleton and made it bipedal (using an iPad program so not very good) and would love to get a 3D model of one to play with to see what a bipedal Dire Wolf would look like. Anyone got a Dire wolf skeleton hanging around?